With its location just about a mile from the Boston Marathon's finish line, each year Tufts Medical Center makes extra preparations to receive patients from the race. Typically, they see cases of exhaustion and dehydration in runners. After the hospital's staff heard and saw reports of Monday's explosions, they knew this year was different. "We knew something was happening shortly thereafter," Dr. Brien Barnewolt, chair of emergency medicine, said at a press conference on Tuesday. "We began to empty out our emergency department and moved patients upstairs into beds in anticipation of things to come." Tufts Medical Center was but one of the Boston-area hospitals to receive victims from the bombings. 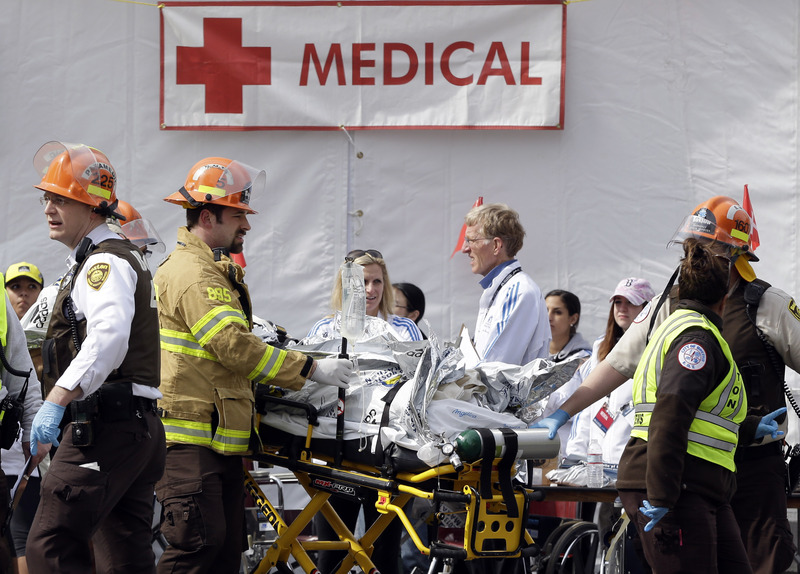 In total, it received 19 patients from the marathon, with 14 sustaining injuries that were blast-related. All of the patients were a mix of runners and bystanders. Ten were admitted, and 10 were still in the hospital as of early Tuesday afternoon. Barnewolt said the one piece of luck Tufts had was that the disaster happened around 3 p.m., when the hospital staff was going through a shift change. They kept people on and had additional support from the people who were arriving. Dr. William Mackey, chief of surgery, heard about the bombing from his office assistant, who shouted when she heard the sound of the bomb going off while listening to live radio coverage. At first, they thought it might just be a bunch of firecrackers, but when they got calls that casualties were coming in they knew something major had happened. Patients began to pour in around 3:30 p.m., with injuries mostly to the knee or ankle. Many had significant leg, muscle and nerve injuries, and open fractures. While there were some near amputations, none of the Tufts patients lost their limbs. Four patients immediately needed surgery, with two more who underwent additional evaluation following soon after. Later, two more people who had more elective procedures entered the operating room. Mackey explained that all the blast injuries contained shrapnel of some kind. One woman even had the handle of a zipper embedded in her ankle, showing how strong the force of the explosion was. The majority of the patients had small metallic objects, ranging in size from a millimeter to a centimeter in size. "It was small shards of metal," Mackey said at the press conference. "There were some people that were cut by flying glass, but most of the material was small metal." While he couldn't identify any of the objects, Mackey believed they were not random. "I think it looked like metal that wouldn't be something that would be lying in the street," he explained, adding the pieces could have come from the bomb, from the fences shattering or from the nearby buildings. Dr. Howard Weinstein, who specializes in pediatric hematology and oncology at Boston's Massachusetts General Hospital, wasn't at his hospital when the victims were coming in. He was on Mile 25 of the Boston Marathon, which he has run for 23 consecutive years. At first, he and his fellow runners though the bomb was just a manhole cover that blew off. "It took 20 to 30 seconds for us to realize it was some horrible tragedy," he told CBSNews.com. Weinstein was running with a 15-year-old who had just finished therapy for lymphoma. They and 105 other runners were part of the Mass General Marathon Team, which has run the marathon for 16 years to raise money for cancer research. "A lot of the runners that were running for charity were the last phase of the marathon, so typically we come in towards the end of the day," he said. "It was timed in such a way so that people who were raising money to help others were hit." Two runners on the Mass General Marathon Team this year were a father-daughter team. The father had run the year before while his daughter was in treatment, and she was looking forward to crossing the finish line with him. When they saw the streets line up with ambulances and fire trucks, and the SWAT teams coming in, they knew there was no chance this year. Weinstein decided to help the Mass Gen team gather at their meeting place in the Prudential Center so family members could find them. He returned to work Tuesday to help continue to provide cancer victims with transfusions and chemotherapy. The doctor said never in his wildest dreams could he imagine this tragedy would have happened. "At Mile 20 we have a huge cheering squad, and our patients and their family members are waiting for us there. There were 300 folks there. I stopped for 5 minutes, and got hugs from my patients and family members. The last thing I could have ever expected to be stopped in my tracks. What was going on, it was probably one of the most shocking experiences that I've really had."